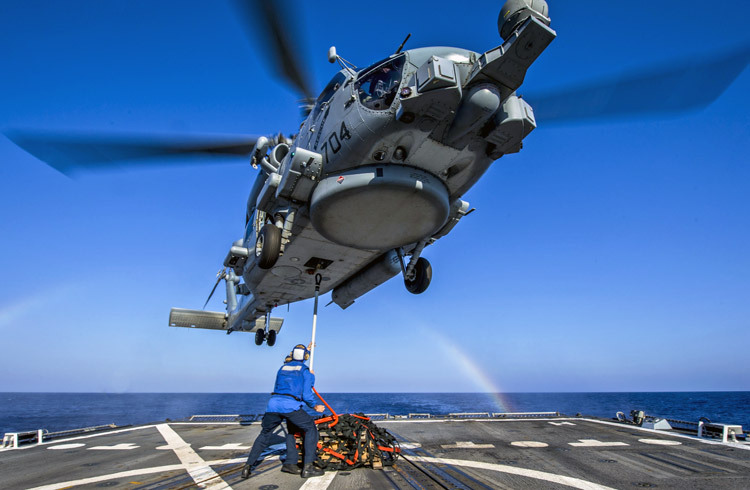 Amidst heightened India-Pakistan military tensions, the US has approved a government-to-government sale of 24 MH-60R Seahawk helicopters to India which will significantly bolster its anti-submarine warfare capability. This approval has been made upon an Indian request. 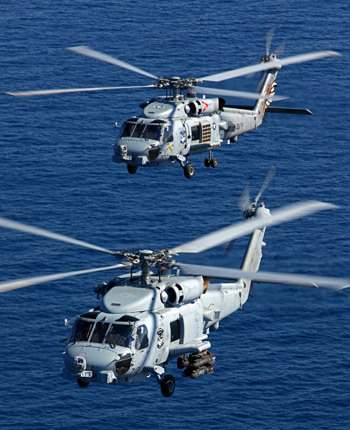 The MH-60R Seahawk is the naval variant of the iconic UH-60 Black Hawk helicopter. "This proposed sale will support the foreign policy and national security of the United States by helping to strengthen the U.S.-Indian strategic relationship and to improve the security of a major defensive partner which continues to be an important force for political stability, peace, and economic progress in the Indo-Pacific and South Asia region," according to a statement issued by the US Defence Security Cooperation Agency (DSCA) on April 2. DSCA is the body which administers the US Foreign Military Sales (FMS) or government-to-government defence deals. "The proposed sale will provide India the capability to perform anti-surface and anti-submarine warfare missions along with the ability to perform secondary missions including vertical replenishment, search and rescue, and communications relay. India will use the enhanced capability as a deterrent to regional threats and to strengthen its homeland defense. India will have no difficulty absorbing these helicopters into its armed forces," the statement added. The US Congress has been notified about this possible sale. "The State Department has made a determination approving a possible Foreign Military Sale to India of twenty-four (24) MH-60R Multi-Mission helicopters for an estimated cost of $2.6 billion. The Defense Security Cooperation Agency delivered the required certification notifying Congress of this possible sale today," it was stated. Submission of the certification kicks off a 30-day notification period to the US Congress. The Congress is not required to specifically approve or disapprove the sale. If there's no action during the 30-day notice period, the process for the sale moves forward. At this stage, the US would be expected to issue a Letter of Offer and Acceptance (LoA) initially valid for 60 days but extendable beyond this time limit. Contract negotiations will begin at this stage. Should the deal go through, Lockheed Martin Rotary and Mission Systems will be the principal contractor, which will also deliver on offsets requirements in the contract. The first aircraft is usually delivered 36 months after the signing of the contract. For most non-NATO countries, the US law mandates Congressional notification for sale of Major Defence Equipment (MDE) of $14 Million and above, Defence Articles and Services valued at $ 50 Million and above, and Design and Construction Services worth $200 Million and above. The procurement of 24 MH-60R multi-role naval helicopters was approved by India's Defence Acquisition Council in August 2017. It issued a Letter of Request (LoR) to the US for an FMS sale in 2018. India has requested a sensor and weapons package for the helicopters which includes APS-153(V) Multi-Mode radars, Mk54 torpedoes, AGM-114 Hellfire anti-surface missiles, Advanced Precision Kill Weapons Systems (APKWS) rockets, N/AVS-9 Night Vision Devices, secure communication systems, and crew-served guns. India has also sought a training and logistics package. The DSCA statement also added that the "proposed sale of this equipment and support will not alter the basic military balance in the region". This is standard text for US FMS process notifications, and not India-specific. A series of recent measures enable India to access US military technology at par with the closest American allies. In 2016, the Obama Administration designated India a Major Defence Partner (MDP). The Strategic Trade Authorisation-1 (STA) status given to India in 2018 is a further enabler for transfer of technologies in the defence and space sectors. Japan and South Korea are the only other Asian countries with this status. The signing of the Communications Compatability and Security Agreement (COMCASA) by India with the US in September 2018, overcoming the hesitation of the previous UPA Government, opens the doors for the transfer of secure communication equipment which scales up military equipment interoperability and sharing of real time data.